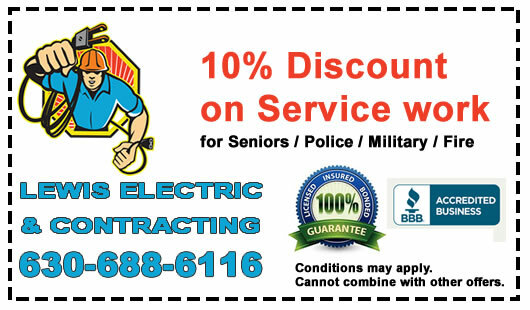 If you haven’t had your home’s electrical wiring examined for several years, it may be out of code. If it is, this not only violates local laws from the National Fire Protection Association and the National Electrical Code, but it can create potential hazards in your home. Lewis Electric understands the laws inside and out, and can bring your electrical wiring and equipment up to code so you can rest easy. Whether you’re planning to sell soon or you simply want a safer home, find out more about code violations and how to fix them. Ground fault current interrupters (GFCI) limit the chances of being shocked, and are the only types of outlets allowed above your counter tops. These outlets can’t be any higher than 20″ from the top edge of the counter, and they have to be found on any counter top that is 12″ or wider. A peninsula or island needs at least one outlet. All outlets must be face-down. For every other room in the house, there needs to be an outlet every 12′, and one outlet on any wall space more than 24″ wide. There also needs to be at least one outlet for any hallway that is more than 10′ in length. Lewis Electric has the trained staff you need to bring your home back up to code, so let us check up on your wiring and equipment today!